Blogs > Jim Loewen > Celebrating John C. Calhoun in Minnesota! Celebrating John C. Calhoun in Minnesota! 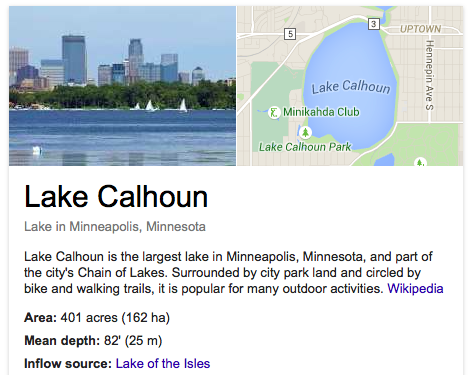 Surely the farthest north point of commemoration for John C. Calhoun is Lake Calhoun, Minneapolis’s largest lake. Hopefully, a group of Minnesotans now numbering in the thousands will be able to change its name. They’re working on it. It is true that John C. Calhoun was an able Secretary of War, from 1817 to 1825. Some Minnesotans defend "Lake Calhoun" for that reason: he was in office when Fort Snelling was built, helping to fortify white settlements against Native Americans. Such arguments miss the arc of Calhoun's life. At the same age, Harry S. Truman ably oversaw the erection of twelve Madonna of the Trail monuments honoring pioneer women, coast to coast. So what? That's not why we remember or honor Truman. After he was Secretary of War, Calhoun took ever more extreme positions favoring the South as a region and slavery as a cause. He called the Missouri Compromise, which he had supported at the time, "unconstitutional," because it banned slavery from territories north of Arkansas. Eventually, he came to place the interests of his region as he perceived them ahead of the national interest, ahead even of national unity. You will see that I have made up the issue between North and South. If we flinch we are gone, but if we stand fast on it, we shall triumph either by compelling the North to yield to our terms, or declaring our independence of them. Opposed to the high tariffs of 1828-1832, Calhoun prompted a national crisis when he got South Carolina to "nullify" them. President Jackson refused to back down, declaring, "Our Federal Union — it must and shall be preserved." Calhoun's threats did get congressional leaders to lower the tariff, however. Having browbeaten his way on the tariff, Calhoun later threatened disunion if Texas was not annexed, if the United States extended diplomatic recognition to Haiti, and even if citizens in northern states continued to agitate for abolition. Should Minnesota honor him for that? In 1837 he told the Senate, "[Slavery] cannot be subverted without drenching the country in blood, and extirpating one or the other of the races." Nor should slavery ever be ended, he went on, because it is "a positive good." This theory relies openly on racism — slavery is good for black people because they are "low, degraded, and savage," in Calhoun's words. Should Minnesota honor him for that? At that time, Calhoun had written that states' rights let Northerners distance themselves morally from slavery. "A large portion of the Northern States believes slavery to be a sin, and would consider it as an obligation of conscience to abolish it if they should feel themselves in any degree responsible for its continuance." By the 1840s, however, he opposed states' rights when those rights had anything to do with freedom, a move calculated to sow sectional discord. By the 1840s, Calhoun had no more use for democracy. He pushed to make the South a closed society. He argued that Congress should not even receive petitions about slavery; sending abolitionist materials through the mail should be a crime. And he insisted that because the Constitution protected slavery, slaveowners had the right to take their property into any territory, even if its residents had voted slavery down. Therefore Congress had had no Constitutional right to pass the Northwest Ordinance, which had outlawed slavery northwest of the Ohio River, including part of Minnesota. Since some of the same people voted for the Northwest Ordinance who later voted for the Constitution, Calhoun could hardly claim to know the founders' intent. Nevertheless, he provided the intellectual scaffolding for Dred Scott in 1857, which reached Calhoun's conclusion seven years after his death. Minnesotans will recall that Dred Scott also references Fort Snelling, since Scott argued that his stay there made him free. Calhoun would have shouted "No!" In 1850 he again threatened secession unless the federal government passed and enforced a harsh fugitive slave law and required slavery throughout the territories. His agitating for secession helped win that fugitive slave law. Nevertheless, on his deathbed he opposed the Compromise of 1850, claiming that it didn't go far enough toward guaranteeing slavery forever. By this point, it is doubtful that any compromise would have satisfied Calhoun. John C. Calhoun is remembered for what he did in the latter half of his adult life. In those years, he rationalized slavery, suppressed freedom of speech, and legitimized secession. Surely that legacy should persuade Minnesotans to rename Lake Calhoun. Every year that the lake remains named for him, Minnesota declares on its landscape that John C. Calhoun was a hero worthy of honor. That declaration insults every black resident and every white resident who does not believe that treason on behalf of slavery made moral or political sense then or now. After Minnesotans rename the lake, they can put up a marker telling what its previous name had been and why it was changed. Then history, not honor, will result.